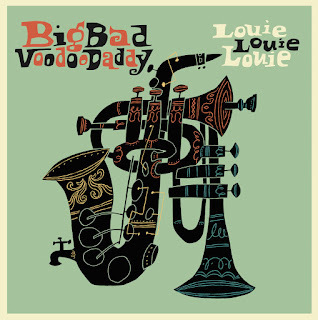 Grammy nominated, multi-platinum selling Big Bad Voodoo Daddy, the incomparable kings of swing, are set to release their all new album "Louie Louie Louie"—an electrifying celebration of jazz legends Louis Armstrong, Louis Jordan and Louis Prima. On their eleventh album and third for iconic label Savoy Jazz, the band is sharper than ever as they pay homage to their jazz heroes. Produced by founder and lead singer Scotty Morris and pianist and arranger Joshua Levy, the album reveals the evolution of swing, jazz and popular music through the songs and personalities of these three giants of American culture. The band continue to tour the US through the end of the year. "Louie Louie Louie" is available now on Savoy Jazz. Founder Scotty Morris said, "We really want people to know about these great men that have so deeply influenced us as, and perhaps help spark a new creative interest in them and their music." Big Bad Voodoo Daddy consists of their original line-up which includes Scotty Morris (lead vocals and guitar), Kurt Sodergren (drums), Dirk Shumaker (double bass and vocals), Andy Rowley (baritone saxophone and vocals), Glen "The Kid" Marhevka (trumpet), Karl Hunter (saxophones and clarinet) and Joshua Levy (piano and arranger). Savoy Jazz is a unit of The Savoy Label Group (SLG). The Savoy Label Group has evolved into a Grammy Award winning and chart topping independent music company with an extensive roster of leading rock, blues, jazz, classical and world recording artists. SLG is led by Steve Vining and is based in Los Angeles, CA.